Pen and brown ink, point of a brush and grey brown wash, heightened with white, over traces of black chalk, lightly squared in black chalk, 21.7 x 20.1; laid down; wm.? Inscribed on the back of the mount: d’après Rosso [Pouncey]. Carroll, 1964 (1976), I, Bk. I, 131-136, Bk. II, 247, D.19, III, Bk. III, Fig. 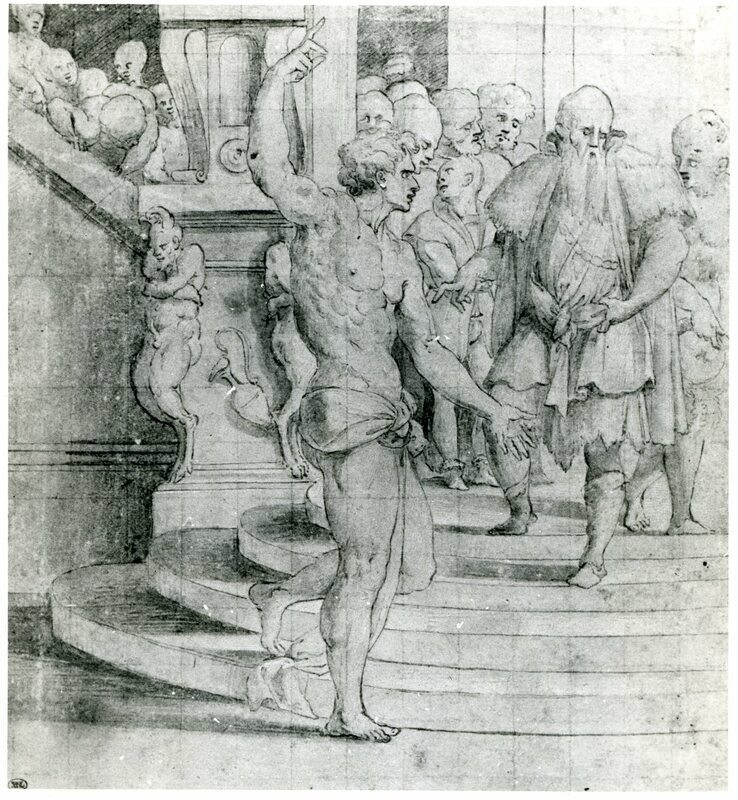 69, as a copy of a lost drawing by Rosso of early 1527. Carroll, 1967, 298-299, n. 9, as a copy of a lost drawing by Rosso. Saint-Morys, 1987, II, inv. no. 10315, giving Morel d’Arleaux’s (843) attribution to the School of Florence. Carroll, 1987, 22, 70, 71, under no. 7, as a copy after Rosso. Franklin, 1994, 155, 285, n. 122, as of uncertain date, and may have been done in France. Under anonymous in the Louvre, this drawing, together with Louvre Inv. no. 10316 and Inv. no. 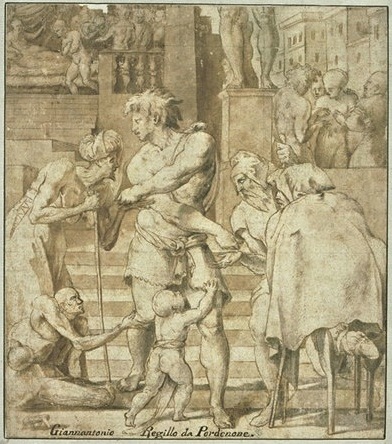 10317 (Fig.D.13 Copy, and Fig.D.14B) form a series illustrating scenes from the life of St. Roch, two of which are copied from lost drawings by Rosso, the third from Rosso’s St. Roch Distributing His Inheritance to the Poor in the Louvre (Fig.D.13). 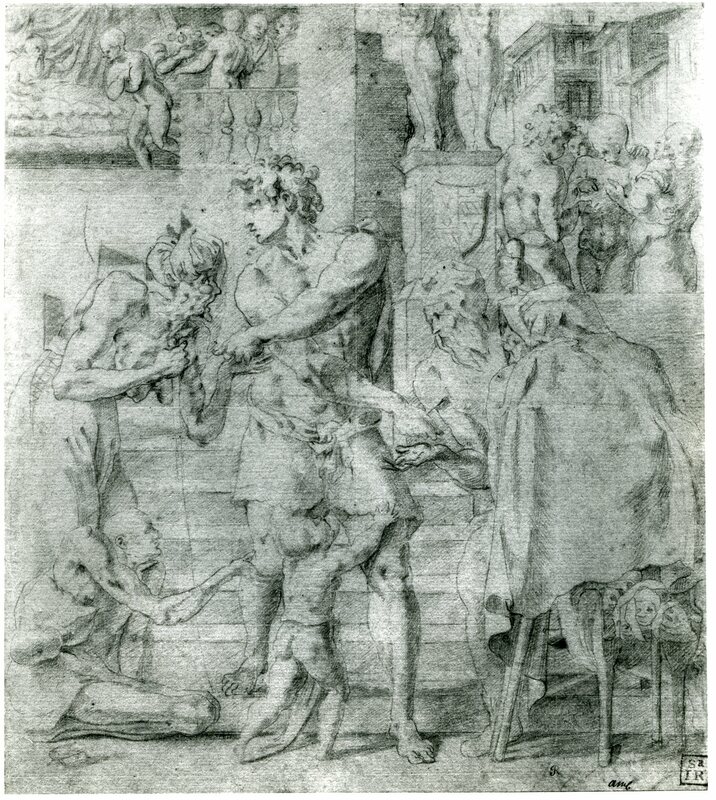 All of these drawings are by the same Italian draughtsman, but not Pordenone, as inscriptions on two of the copies indicate. Fioco attributed the other two copies to Altobello Meloni. 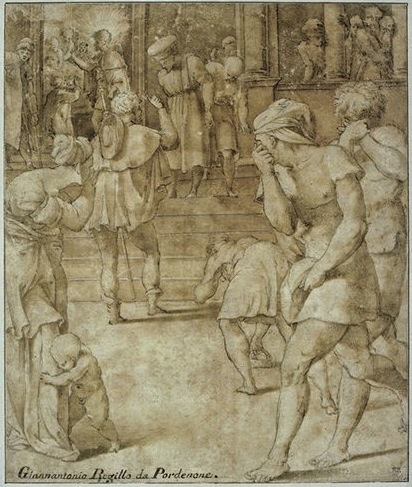 The lost drawing, like Rosso’s autograph drawing in the Louvre, was probably executed in red chalk (but see comments related to D.14A), and was certainly done at the same time, most likely in the summer of 1524. As Louvre Inv. no. 10316 copies Rosso’s original drawing very accurately, it may be assumed that Louvre Inv. no. 10315 is also an accurate copy, but in this case of a lost drawing by Rosso. Its size is almost exactly the same as the autograph drawing and the copy of it. 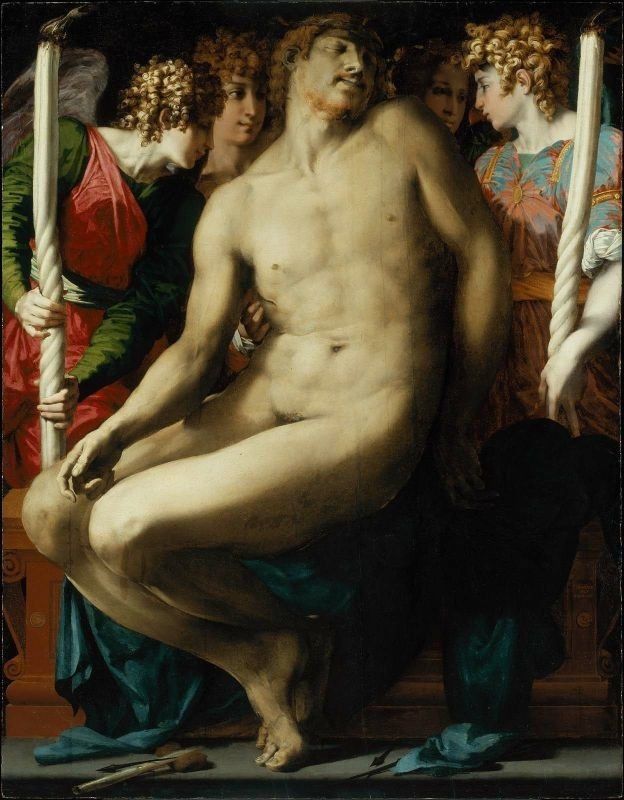 The scrolls and disc that decorate the architecture immediately behind the raised arm of the wingless angel are similar to the decorative motifs on the sarcophagus of Rosso’s Dead Christ in Boston (Fig.P.18a), done in 1525 or 1526. 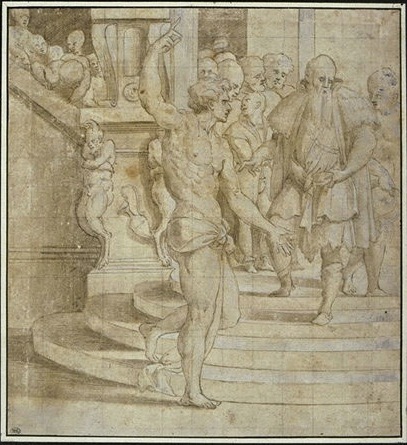 The drawing, which shows the saint bald and old and with a long beard, would seem to represent the “angel of God” announcing to St. Roch at the end of his life that God has granted him “what thou now desirest” that “all good christian men who reverently prayed in the name of Jesu to the blessed Rocke might be delivered surely from the stoke of the pestilence. At this prayer so made, he expired and gave up the ghost,” as told in the Golden Legend of Jacobus de Voragine, although it is possible but less likely that it represents the angel announcing to Roch his deliverance from the plague where, however, the Golden Legend has him sleeping, as also indicated in the scene where an angel tells him he has been struck by the plague (see Voragine, V, 1900, 5, 9, 10-11, and Reau, III, 3, 1959, 1156, 1161).